The 800-year-old church is not only an important landmark for Catholics, but for art historians as well. One of France’s most famous landmarks, the medieval Cathedral of Notre Dame in Paris was engulfed in flames beginning just before 10am PST. It has been reported that its spire and roof have collapsed. Officials have said that the fire at the landmark could be linked to renovation work. 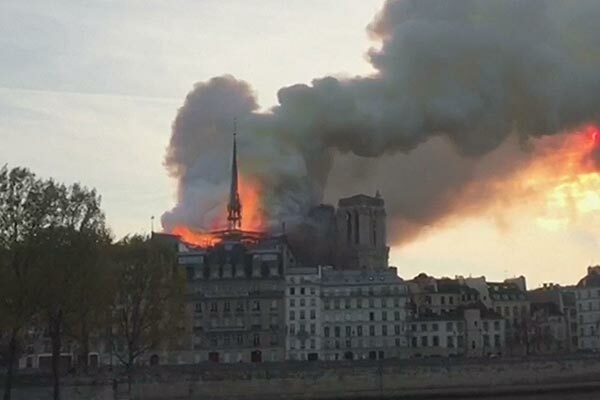 According to BBC, “a Paris fire official said the main structure had now been ‘saved and preserved,” and that the cathedral has been saved from “total destruction.” Nearby residents have been evacuated in case of building collapse, according to Paris Mayor Ann Hildago. 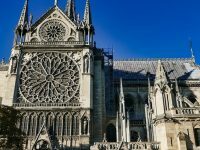 “All efforts are being directed towards saving the artwork stored at the back of the cathedral, which had been undergoing renovations and preventing the collapse of its northern tower,” according to CNBC. Bystanders have continued to watch the 850-year-old Gothic structure burn, some with tears, shocked expressions, and some documenting the catastrophe with their smartphones. However, the Paris mayor and firefighters have “warned people to say away from the area.” So far, there have been no confirmed deaths. The cathedral is known for being featured in Victor Hugo’s classic novel The Hunchback of Notre-Dame and draws in large amounts of tourism every year. President Emmanuel Macron arrived at the location of the fire and met with the Paris Police. 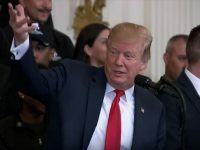 He expressed grief on his Twitter account. Prime Minister Theresa May also expressed support.